blog.HalloweenAdventure.com | Latest News from the Costumes Trend FrontLines! : CLONE WARS! This summer was full of big blockbusters, but one of our favorites was the Star Wars flick Clone Wars. Do Halloween right with our fabulous Clone Wars costumes, and watch a clip of the movie here. 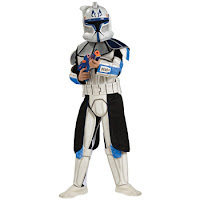 The number one stunner is our Clone Trooper Animated Cody Costume. Clones just don't come any cooler than Commander Cody! This awesome Star Wars Animated Clone Trooper Commander Cody costume includes a printed Clone Trooper jumpsuit with panel detailing and a full Commander Cody helmet/mask. Take control of the festivities in style! Check out our other Clone Trooper Cody Costume here. Our Deluxe Clone Trooper Leader costume will have you leading the way! Second in command in the Clone Wars; you're a no-nonsense guy! Your costume includes a full two-piece Leader Rex helmet, a utility belt, and a very authentic looking Star Wars jumpsuit with body armor that looks like you just walked off the movie set! You were made for battle, so you're always ready! 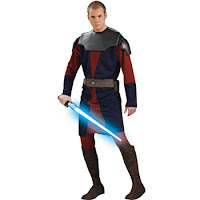 Be the ultimate vessel of the Force in our Clone Wars Deluxe Anakin Skywalker Adult Costume. The Star Wars Animated Deluxe Anakin Skywalker costume includes a red and black tunic with attached armor, red pants with attached boot tops and brown belt. If you're ready to go to the dark side, this is the costume for you! Prepare to lead in our Clone Wars Deluxe Plo Koon Adult Costume! 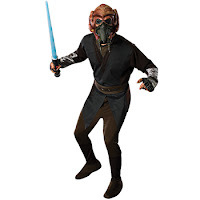 This officially licensed Star Wars Clone Wars Deluxe Plo Koon costume includes the navy blue tunic, brown pants with attached boot tops, character mask, Plo Koon belt, and gloves as shown. Totally bad! Lastly, check out our Star Wars Animated Obi Wan Kenobi Adult Costume. Become the coolest Jedi Master of all time in this awesome Obi Wan Kenobi costume! The Star Wars Obi Wan costume includes a printed tunic featuring authentic Star Wars Jedi insignia on paneled sleeves, matching pants with attached boot tops, a cool belt to accent it all, and a handsome Obi Wan mask.